On the way from Miami to the oldest city in America we stopped at Daytona Beach to walk on the ‘hard-packed sand beach that hosted NASCAR racing for over 50 years before the Daytona International Speedway was completed. St. Augustine, founded in 1565, is the oldest continuously occupied settlement of European and African-American origin in America. The Spanish established St. Augustine forty-two years before the English colonised Jamestown Virginia, and fifty-five years before the Pilgrims landed at Plymouth Rock Massachusetts. Spain ceded Florida to the United States in 1819 with formal U.S. occupation beginning in 1821. 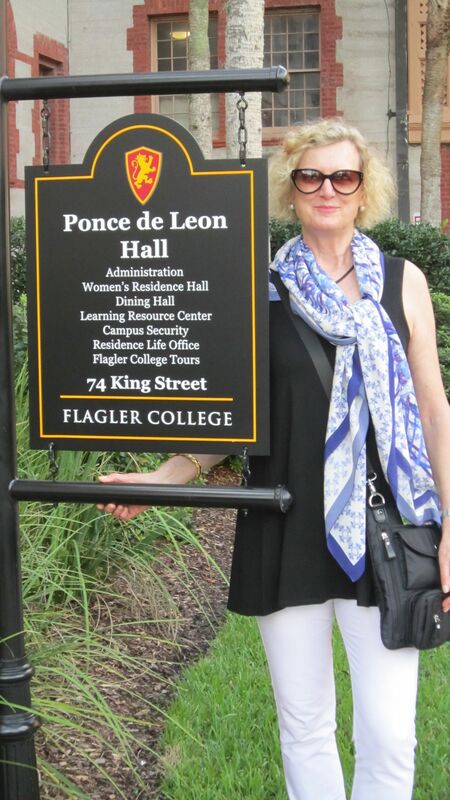 Visiting all the sights was easy – we hopped on and off the Old Town Trolley bus (around $25 for unlimited day use); visiting the Lightner Museum, formerly the Hotel Alcazar, built in 1887 in the Spanish Renaissance style by Henry M. Flagler; Flagler College originally built in 1888 as the luxury hotel Ponce de Leon – you guessed it by Henry Flagler. Flagler was an American industrialist and a founder of Standard Oil and the Florida East Coast Railway. The Castillo de San Marcos National Monument makes for some good exercise. Castillo de San Marcos is a 17th-century fort built to protect the settlement of St. Augustine and actually took 23 years to build (from 1672 to 1695). Then there is St. Augustine’s first lighthouse built in 1565. As it was at the end of a long day we did not venture up the 200 steps to the observation deck! This visit gave me a glimpse into a part of American history I was not familiar with and also how wealthy industrialists helped to develop America.